Data center convergence and virtualization offer the promise of improved efficiency and flexibility. Developing a network visibility strategy when planning the network upgrades needed to support convergence is essential since only network equipment with embedded traffic monitoring will provide the data center wide visibility essential for effective control. This article examines the proprietary and standards-based protocols for embedded traffic monitoring as well as their current status and level of support. Before looking at the standards, it's important to understand how current traffic monitoring protocols fit in the protocol stack. The article, sFlow and NetFlow, describes how sFlow operates at layer 2 (switches) and Cisco NetFlow (and variants from other vendors such as j-Flow, NetStream, LFAP etc.) operates at layer 3 (routers). The IETF has recently developed a standard alternative to proprietary IP flow monitoring protocols (Cisco NetFlow, j-Flow, LFAP, NetStream etc.). The IPFIX standard was created in order "to transfer IP flow data from IPFIX exporters to collectors." This focus on IP flow export is consistent with the IETF's responsibility for the TCP/IP suite of protocols and explicitly avoids addressing layer 2 monitoring (switches). The IPFIX standard was published in 2008. Unfortunately, IPFIX has found little support among router vendors, who continue to implement proprietary solutions. The IEEE publishes the standards for Ethernet and bridging/switching, and is currently developing the set of standards for Data Center Bridging (DCB) that are driving data center convergence. The IEEE would seem to be the natural place to standardize a protocol for monitoring switched Ethernet traffic, however, the IEEE's focus is on the mechanics of layer 2 connectivity and network management protocols have not been a priority. The sFlow.org industry consortium was formed in order to develop a multi-vendor standard to address the need for network visibility in layer 2 devices. Many of the members of sFlow.org actively participate in the IEEE standards process, ensuring that sFlow is well matched to the challenge of monitoring current and emerging IEEE standard networks (Ethernet, 40/100G, DCB etc.). The sFlow standard was published in 2001 and it is now implemented by most switch vendors (see sFlow.org). In selecting a standard for data center visibility, it is important to understand how data center networks are changing. The traditional three layer architecture, in which traffic is moved up to the core and back, does not scale well. Instead, the trend is to integrate access and aggregation layer switches into a flat layer 2 network using shortest-path bridging (IEEE 802.1aq) so that traffic bypasses the core to deliver the increased scalability, bandwidth and reduced latency needed to support converged data center workloads. The shift in data center network architecture requires a corresponding shift in network management. Instead of monitoring and controlling at layer 3 in the core routers, visibility and control functions move to layer 2 switches and the network edge. sFlow is the only standard specifically designed for embedded monitoring of layer 2 devices. Selecting switches with embedded sFlow provides a low cost, scalable means of obtaining layer 2-7 visibility into all traffic flowing over the switched network (including storage traffic). Building a network visibility strategy around the sFlow standard maximizes the choice of vendors and ensures interoperable monitoring in mixed vendor environments, eliminating vendor lock-in and facilitating "best in class" product selection. 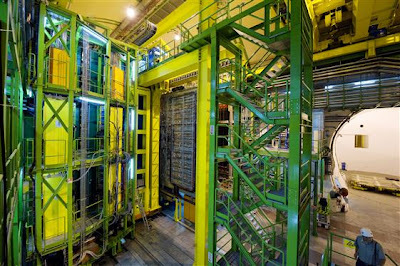 The Large Hadron Collider at CERN has been in the news as it comes online. An interesting paper (Management of the LHCb Network Based on SCADA System) describes the data collection network associated with the LHCb experiment. High-speed switched Ethernet networks are used to collect measurements from the experiment and to control its operation. The paper states that, "Sophisticated monitoring of both networks at all levels is essential for the successful operation of the experiment." The network monitoring system uses sFlow to measure network utilization on the core switches. "Because there are so many ports in the core switches, the SNMP query of interface counters takes a long time and occupies a lot CPU and memory resource." The distributed counter polling mechanism in sFlow provides a highly scalable alternative to SNMP polling, delivering reliable monitoring in the most demanding environments. Network visibility in the data center is equally important and sFlow provides the scalability and performance needed to maintain effective control of high-speed data center networks.